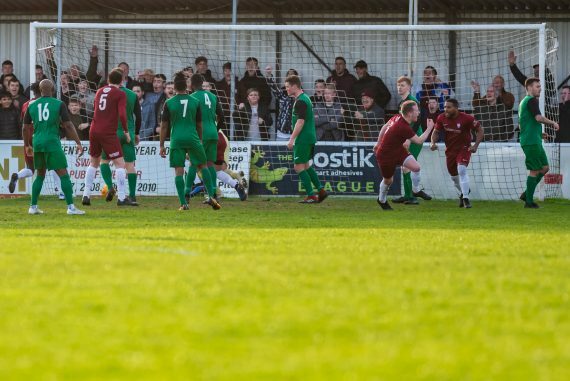 Cray Valley PM are on their way to Wembley but they made hard work of it, Canterbury City as expected certainly had a good go at overturning their first leg deficit, and they very nearly did it. The visitors seemed happy at first to defend their one goal lead and soak up the early pressure from the hosts, which gave them confidence and made for an excellent cup semi-final second leg. There was one notable change for Cray with hero keeper from the first leg Andy Walker unable to recover from the injury that he picked up in the first leg. Deren Ibrahim was drafted in out of retirement to take his Walker’s place between the sticks, not often an international keeper is drafted out of retirement. The game was delayed for 15 minutes enabling the record crowd to get in, once the game started you could see the nerves in both teams, in the very first minute Anthony Edger ran forward without anyone in a Canterbury shirt attempting to tackle him, and from 20 yards he tried his luck but the shot was easily saved by Jack Delo. Canterbury then took the game to Cray and in the 18th minute they nearly had a crazy goal when the ball played back to debutant Ibrahim who took his eye of the ball and let it go under his foot, it was heading goal-wards but he reacted quickly and cleared it before it went into the back of he net. The game saw Canterbury having most of the possession but not creating much while Cray relied on counter attacks to get forward. Then in the 36th minute Canterbury nearly took the lead when a Ryan Cooper ball into the area found Ollie Lee, from 10 yards his shot came back off the crossbar. In the 42nd minute Cray had their first real chance of the game when Gavin Tomlin was put through on the left, as he went into the area he stopped, cut inside and from an acute angle saw his shot go past the far post. Shortly after this the half time whistle went and the question of who would be representing Kent in the FA Vase final was very much still unanswered. The second half started with Canterbury pressing forward and looking to get back on level terms in the tie. The first chance of the half came in the 47th minute when a Cooper long throw into the area was half cleared to Bolo Dawodu whose header forced Ibrahim to tip over the bar for a corner, the resulting corner came to nothing. Another chance came 4 minutes later when another long throw into the area by Cooper found Lee but his goal bound header was cleared off the line by Edgar. In the 53rd minute Cray had their first chance of the half when Ryan Flack received the ball 20 yards out, his effort went just past the post. Four minutes later another chance went Cray’s way when Danny Smith on the left got to the by-line and crossed to the back post where he picked out veteran striker Kevin Lisbie, his downward header went right across the goal. Cray were now getting more possession but still relying on counter attacks, in the 70th minute Tomlin on the right touchline headed into the path of Lisbie, he ran forward but saw his shot from 15 yards go past the post. In the 72nd minute Cray scored when Smith in the area received the ball from Tomlin and weaved his way for a shot which was saved by Delo’s legs but came back to Tomlin who from 8 yards curled the ball into the net, to give Cray a two goal lead in the tie. Some in the crowd could be forgiven for thinking the game over but Canterbury took the game to Cray hoping to get back into the game, in the 87th minute a free kick to the back post saw Cooper head just wide, a minute later a ball out to Kyran Lightfoot on the left wing saw him cut inside but his shot went wide. In the 90th minute Canterbury equalised and with 4 added on minutes coming up they had time to make it a nervy end to the match for Cray fans, players and management. The goal came when another long throw into the area came out to Gary Sayer and his volley from 10 yards hit the back of the net. In the second minute of time added on a cross to the back post found Cooper but his header ended up looping over the crossbar and onto on the roof of Ibrahim’s net. Time was running out for City, in the third minute off added on time Francis Babolola received the ball on the left touchline, he went past the defender and from an acute angle forced Delo to save with his legs for a corner. 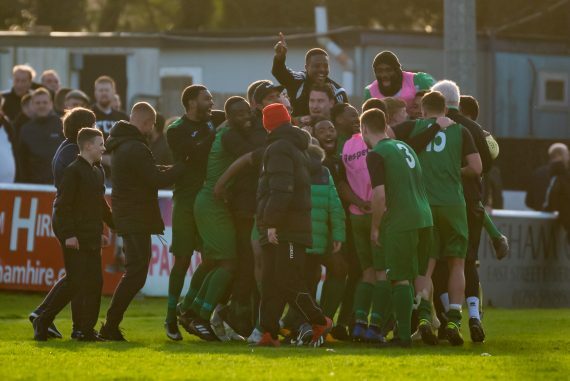 The final whistle went and the Cray players formed a circle and jumped in joy as they will be making the trip up Wembley Way for the FA Vase final. Whilst the Canterbury players took the applause from their supporters and left the field knowing that had they been a bit more clinical it would have been them not Cray at Wembley but what a journey they have had. 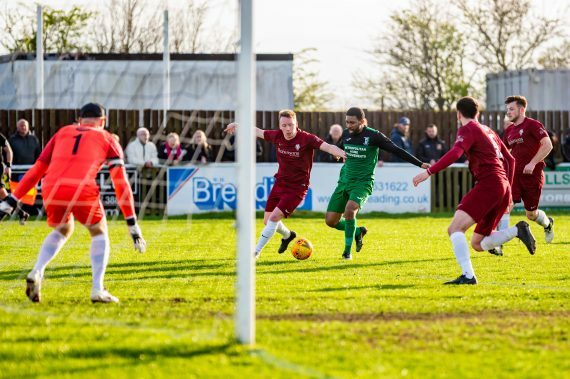 This entry was posted	on Saturday, March 23rd, 2019 at 4:56 pm	and is filed under Featured, Football, Non-League Football. You can follow any responses to this entry through the RSS 2.0 feed. Both comments and pings are currently closed.